Front A-arms generally use spherical bearing ball and socket joints to connect to the steering knuckles. 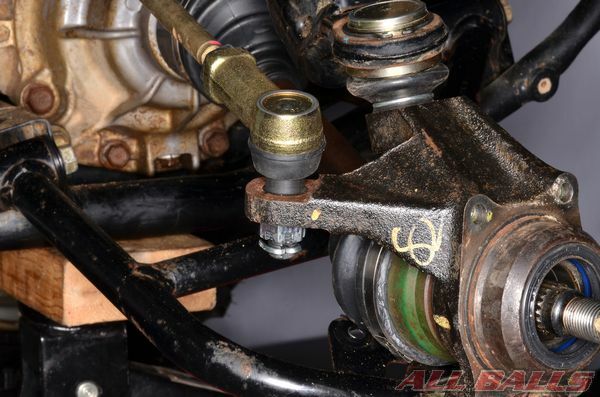 The steering tie-rods connect to the steering shaft and knuckles with ball joints, and they can be used to connect rear A-arms to a stabilizer bar via a tie-rod. These ball joints can be damaged and wear out. Often the ball joint must be replaced with its component, but in some cases the joint alone can be replaced with OEM parts or kits from a quality aftermarket specialist like All Balls Racing. Inspect the movement of the ball joint. It should be able to turn and pivot smoothly but without looseness or free play. Grip the pin and attempt to move the ball side-to-side and up and down in the socket, replace the joint if it has play. Check the ball joint boot for wear or damage and replace any ball joints with damaged boots. 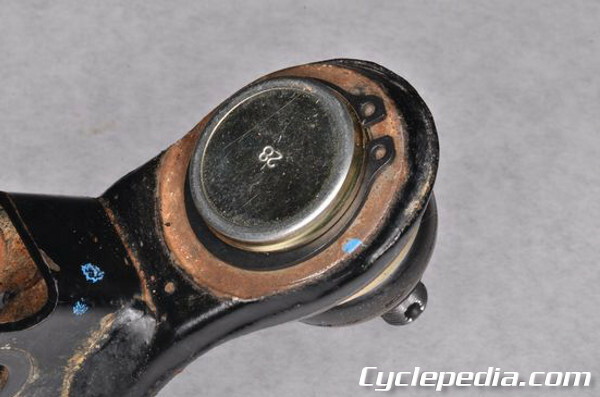 If the knuckle or A-arm ball joint is replaceable it will most likely be held in by a snap ring. Remove the snap ring with snap ring pliers. Replace the snap ring with a new item on assembly. Support the A-arm with a suitable tool that will allow room for the ball joint to fall out. Press out the ball joint. 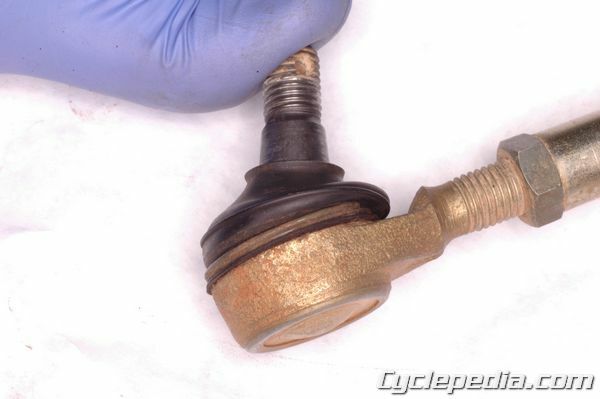 Clean away all of the old grime and rust from the ball joint bores. 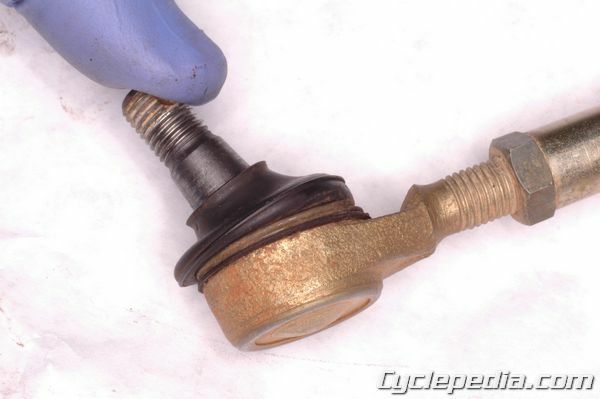 Remove any burrs that may inhibit the installation of the new ball joints. Install the new ball joint with a press. Use a suitable tool that will only contact the metal outer lip of the ball joint. Make sure the ball joint is fully seated and the boot has not been damaged. Secure the joint with a new snap ring. 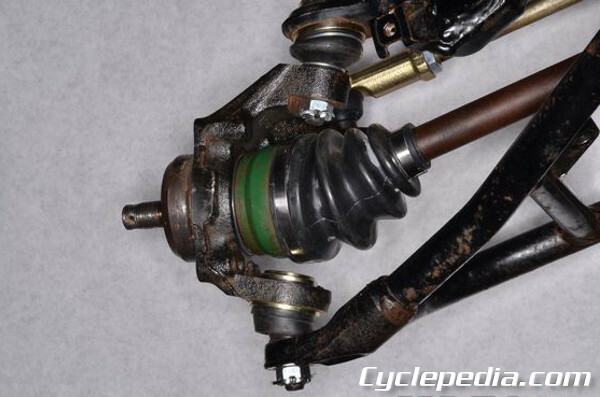 If a steering tie-rod has a damaged ball joint it may be able to be replaced with a new tie-rod end. Replace the tie-rod as a whole if the rod is bent. Note the position of the ends. Some vehicles have specific instructions for tie-rod length and end positioning. Check the service manual for the specific information for the vehicle. Install the new tie-rod end and lock nut onto the rod. 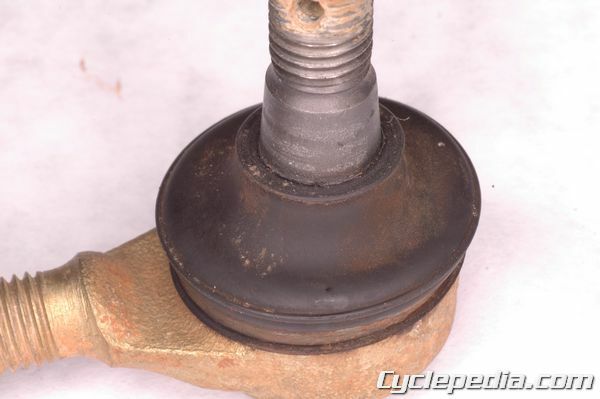 Usually the outer tie-rod end and lock nut have reverse threads. Set the position and distance between the tie-rod ends according to the OEM requirements listed in the service manual. Install the tie-rod to the steering shaft and knuckle. 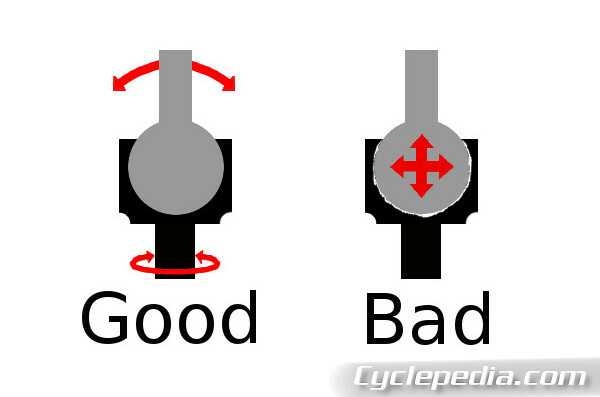 Make sure the ends are positioned correctly so the ball joints are not at severe angles. Assemble the vehicle and inspect the toe-in alignment. 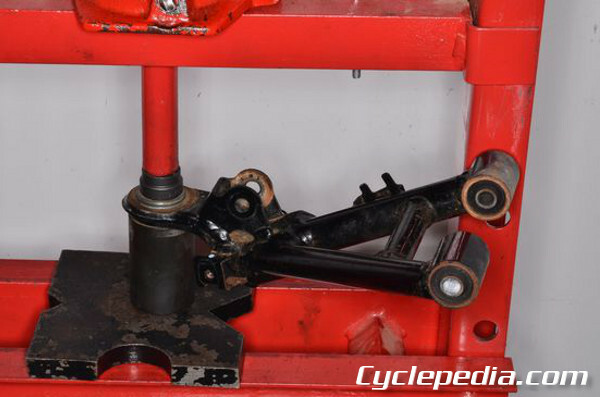 Adjust the tie-rods evenly to maintain correct steering alignment when setting the toe-in. Check with the service manual to see if there are any specifications for the length of the tire rods or the amount of threads that should be showing. If the tie-rods are not adjusted according to the OEM specifications the proper toe-in may be achieved, but the vehicle will not steer correctly and it could be at risk of breaking a tie-rod.